Powers/Abilities/Functions: The original Wicker Man (Men) served merely as a prison/container, which could then be set on fire to immolate those trapped within it. On Earth-616, the Wicker Man was a giant humanoid figure contstructed out of wicker, in which people and/or animals were placed, and then set on fire. This may have been done as punishment for the foulest criminals, as was done by the ancient Celts, or as sacrifices to bloodthirsty gods, as was done by the Druid sects. (Chaos War: Dead Avengers#3 (fb) ) - A Wicker Man was burning in the background when Anthony Ludgate came to the sacred oak circle as an initiate to become Doctor Druid. (Black Knight I#4) - In London, Morgan and Mordred cast a spell sweeping up a mob of people who had gathered below. The people were contained within a Wicker Man of magical energy, which Morgan then set against her enemies: the Black Knight (Dane Whitman's body inhabited by Sir Percy), Dr. Strange, and the Valkyrie (possessing Victoria Bentley). Strange uleashed a spell at the Wicker Man, but recalled it--at much pain to himself--when he realized it would harm those inside. The Black Knight attacked it, but it grasped his sword, drew on its power fired an energy blast that incapacitated all three of its opponents. Strange and the Valkyrie were imprisoned within the Wicker Man while Sir Percy was forced to swear allegiance to Morgan and Mordred at the threat of the deaths of all within the Wicker Man. (Druid#1) - Anthony Ludgate has a vision back his ancestral line to the days when Lud's gate was lit by the glare of men and cattle burning in great wicker men. Comments: Created by the ancient Celts and/or Druids. Adapted to the MU by Roy and Dann Thomas and Rich Buckler. Yes, from my understanding, the Wicker Man was used by the Celts or Druids as a repository for their sacrifices, which were burnt. 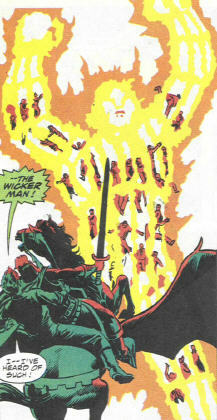 I believe that there is some connection between the Wicker Man and the "Burning Man" used in New Age Wicca (See Blair Witch Project and the Burning Man festival, the latter of which appeared in X-Force 75) The modern Wicca probably adopted it along with other Druidic rites. John McDonagh: http://www.straightdope.com/classics/a981113.html has a discussion of the Wicker Man legend. My personal feeling is, if the celebration progresses to the point where you're setting fire to the in-laws, you really shouldn't have opened that last jug of Manischewitz. The wicker man ritual was described by Julius Caesar in Book Six of The Gallic War, in which he describes the customs of the Celts of Gaul. He writes: "The whole Gallic race is addicted to religious ritual; consequently those suffering from serious maladies or subject to the perils of battle sacrifice human victims. . . . Some weave huge figures of wicker and fill their limbs with humans, who are then burned to death when the figures are set afire. They suppose that the gods prefer this execution to be applied to thieves, robbers, and other malefactors taken in the act, but in default of such they resort to the execution of the innocent." Caesar wasn't the type to retail wild stories. On the other hand he evidently hadn't witnessed a wicker man sacrifice himself, and as far as I can tell no other classical author mentions it. So it's hard to say how common this practice really was. But it's definitely caught the modern imagination. One of the most disturbing retellings was the 1973 film The Wicker Man, starring Christopher Lee, Edward Woodward, and Britt Ekland. Woodward plays a cop who travels to a remote Scottish island to investigate a disappearance and winds up entangled in pagan carryings-on that culminate in . . . well, you can probably guess. It's all very eerie and understandably became a cult classic. Of the several extant versions, the original 103-minute cut is said to be the best; for more information, see www.reocities.com/ Hollywood/Academy/8049/index.html. More recent takes on the wicker man have been only marginally less macabre. At the genteel end of the spectrum are the modern pagans who reenact wicker man burnings as a purgative ritual. No humans are actually burnt, aside from the occasional warlock singeing himself with his Zippo. Far more interesting is the annual Burning Man Festival, a bizarre combination of participatory art event and beer blast held the week before Labor Day in the Nevada desert. No direct line can be drawn between the Gallic wicker man and the Burning Man Festival, which drew 15,000 this year. The festival, I'm told, began when one of the founders torched an effigy on a San Francisco beach in 1986 to purge himself of negative vibes after he broke up with his girlfriend. However, if we consider the salient features of the Gallic and U.S. events--flaming destruction of a giant wooden man, frightening pagan rituals, torching of the innocent (well, severe sunburn and dehydration of the innocent, anyway)--we see that they're closely related. Or more accurately, that they spring from the same font of pyromania that makes kids join the Boy Scouts. Cecil's friend Shauna, who attended this year's festival, describes it as a testosterone-driven affair in which any number of art, uh, thingies, many of them quite impressive in an unhinged sort of way, were assembled and then gleefully destroyed over the course of the week. The grand finale was the destruction of the 50-foot-tall Burning Man himself, which was accomplished with enough flame, explosives, and noise that I daresay even the guys in my old Italian neighborhood would have been impressed. For more, see www.burningman.com. Will U: Wicker crafting was traced to the ancient Scandinavians. The Cimbri tribes of Europe used huge wicker images of men to contain and burn alive criminals and other evil-doers in addition to impalement. The Gauls and Celts later used the practice to sacrifice their enemies to their gods. The also used small straw man effigies to burn in homage to the great thunder god Taranis brought to them by the invading Greeks. Alledgedly, the Celts had an habit of honoring the gods of their invaders rather than offending them.